"I'm A Gorgeous Runner" is the motto of the Gorgeous Series. Gorgeous Gurus are the ambassadors of the Gorgeous Series. They share the joy they get from running with others. And they want you to know that YOU are a Gorgeous Runner too! ​Go to our How to Relay page to get the Gurus' advice on running your first relay! If you would have told anyone that I grew up with that I would be a running coach and trainer they would one hundred percent not be surprised. In fact, it would be all but expected. Running was my life for my entire childhood and up until college when I took a quick break to indulge in some other sports (rugby and boxing). My name is Alexa Hasman and I am a Portland-based running coach and trainer and owner of Fit Life. My job is to help people find their goals, reach their goals and exceed their goals through running and fitness. It is pretty much the best job ever and incredibly rewarding to watch people realize things they never thought were possible or to push themselves to limits they never thought they could do. I got involved with the Gurus because, quite simply, they have the best community and events. The race directors, Traci and Kerry, make sure they know and acknowledge all their runners and team members. This in turn, creates the most welcoming and inviting group of runners. Outside of the community, the races are well run, creative, fun and unique. I am a relay running junkie and the Gorgeous Relays are my absolute favorites! I personally relay for fun, friendship and a great way to get in some quick leg turnover. The experience is unbeatable and the friendships that are formed while in a van and through competition are unbreakable. I am so looking forward to this Gorgeous Series season and posting some fun articles to get you RELAY READY! Check out Alexa's Gorgeous Blog post - Pro-tip: Coming back to running in a healthy and strong way. I started training for my first marathon in March 2010. After cheering on a friend at the Portland Marathon the following year, I decided I wanted to challenge myself and run it. I had done a few races before (5Ks and 10Ks), but nothing super challenging. Training for a marathon and completing my first is what made me fall in love with running. I have run four marathons, an unofficial ultra (the entire Wildwood Trail), six relays, and too many half marathons to count since. My kids are what inspire me to run. I have two boys (a 3 1/2 year old and a 10 month old). Working full time as a teacher and being a mom, it can be a challenge to get in a run some days, but it's my "me time," so I make it happen. My husband is also a runner, which is how we met, and we run our long runs together on Saturday mornings. He pushes our boys in the stroller and they love it! It's part of our weekend routine. My tip for anyone wanting to get into running is to get a race on the calendar. When you have a goal, it gets you out the door with your running shoes on. Relays, like the Gorgeous Series, are a great way to start! You get to run with your friends, cheer each other on, and celebrate together when your team finishes. So get out there and I hope to see you on the road! I started running 14 years ago because I broke my toe and was side-lined for 2 months and had opted for a sedentary lifestyle. I wanted to do something quick and affordable to drop the weight I had gained, so I picked up running. I honestly had no idea what I was getting into. I didn't follow a "couch to 5k" plan. I put on my mp3 player (yep way back then, those things were the rage!) and headphones and ran a song, walked a song. I upped my intervals to run 2 songs, walk a song, until I could run a whole 30 min without stopping. After that, I started running 5ks, training for my first half marathon (Dallas White Rock half in 2003) and just kept going. Since then, I've run 35 half marathons, a marathon, a 50k, countless 5k/10k/15ks and numerous relays. I am motivated to run to stay in shape and keep my sanity in check. I think what makes a Gorgeous runner is just enjoying every run as it is and take in the scenery, no matter where you are. My advice to new relayers is to go with the flow and just have fun. Leave the clipboard behind and run each leg as it happens. You can find me on Instagram as @awesome.andie. I started running in 2012 after a pretty extensive back surgery and a doctor telling me I should never run again. Shows how much I listen. I run for the peace that I get when I am on the road listening to music. I find this is the only time that my kids can’t find me and that I can truly have a break for personal balance. I don’t run very fast, in fact, you will typically find me at the back of the pack just trudging along at my own pace. At least I am moving, right??? Since 2012 I’ve run several 5ks and 10ks, Hood to Coast 2016 & 2017… and completed my very first Half Marathon with the Bend Half in 2017. My biggest accomplishment was running with my husband and family in the Hood to Hood Relay 2017. I love running relays with Gorgeous more than any other races since my family gets involved and we concentrate on having fun more than anything. This year you will see me volunteering more than running since I just had reconstructive surgery on my ankle and should be running until July at the earliest. See you on the course. I will be wearing a bright yellow volunteer shirt and ringing a cowbell. You'll often find Claude leading a group for a Gorgeous Pub Run, managing the finish party at a Gorgeous Series relay, or sweeping a steep muddy trail to run in the final runners. When he's not doing any of those, you'll probably find him getting in a run with the NoPo Run Club. I am originally from Michigan and migrated West one winter 6 years ago…. I didn’t know Michiganders were supposed to fly South. NEEDTOBREATHE “Feet Don’t Fail Me Now” I won my first ever race to this song, it came on with less than a mile to go in my 10k and it pushed me into 1st place!! You mean there are other things to do in this world besides run? Growing up, I was never much for team sports, and found solo activities like hiking, bicycling, and running a better fit. I began running for exercise in college and ran my first Hood to Coast in 2001, and it has been a part of my life ever since. Running is whatever I want to make of it. It can be fun or serious, easy or hard, relaxing or challenging, or all of the above. I'll run in any weather conditions. ANY. I like the challenge. When I'm out there, trail or road, the miles help focus me and allow me to problem solve all sorts of things going on with my work or life. When I'm not running, I'm busy with my business -- an international website hosting and domain registration service -- as well as being an attentive husband and father to very energetic young men. Hi, I am Hannah. Wife, mama, fitness instructor, adventurer, reader, and most recently a runner. Funny enough, I grew up hating running. I thought people that ran for fun were crazy. It wasn’t until I had a friend who loved running telling me, “I would love it and to just give it a try,” that I tried it, and truly found joy and beauty in it! At first it was just an easy way to get out and get into shape. Then, it was seeing what my body was capable of and how amazing that was (and still is). From there, I completed my first half (the Bend Half Marathon), Hood to Coast, my first trail 10k, another half and hopefully a marathon in my future. Through all of it, my support system (My tribe: hubby, kiddos), the community I have found, and the friendships I have formed have kept me going in this crazy thing called running! I love just getting out, that’s half the battle and once you do you won’t regret it! Follow along on my crazy adventure called life on instagram @mrsnickless or Facebook! Cheers! I started running in 2012 when my much younger neighbor, after a bottle of wine, convinced me that running was fun! I remember that first mile - it was so long. I remember my first half marathon - after being stung by a baldfaced hornet, not being able to run much after mile 7 because my leg was killing me, struggling through the rain on the trail and coming across the finish line crying - it was awful but I did it - I finished that race. Now I ponder that first mile and when we hit mile 6 or even sometimes further, I realize that I can run any distance I put my mind to. As they say the longest distance is the 6 inches between your two ears. Although I am not a natural runner, I really do enjoy it. I love the moment running across the finish line knowing that I did the race, training run all on my own two feet. I would encourage everyone to get out and try to run - every movement you make increases your health and your mind body strength. For me, I don't take myself too seriously when it comes to racing - I would really rather have a great time out on the course and run across the finish line with a giant smile then have killed myself out on the course. I think a Gorgeous Runner is anyone who gets out there and runs/walks and inspires others to get out and do the same. If you want to follow some funny photos, great locations, fun people my Instagram is jillmingo. My mantra is Have Faith - you can do anything you put your mind to - I promise. Hi, my name is Kelly and I’m a stay at home mom to 3 kids, 8, 4 and 2. Outside of my home I work a few hours a week and teach fitness classes at the local YMCA and recently coached my first Couch to 5k running program. I have run on and off for the last 15 years but really started running consistently after my second child was born in 2013. I enjoyed the friendships I made and the discipline it took to train for races. Collecting fancy medals was fun too. I’ve run 5ks to 25ks and everything in between. In 2014 I ran my first trail race and I’ve had my sights on completing of a 50k trail run ever since. In 2017 I ran in my first gorgeous relay and ended up running my second a couple months later. I’ve been involved with other relays before but the thing that had me coming back to the gorgeous series was the well organized relay, the awesome fellow runners, and the fact that you get to sleep in your own bed at the end of the day! There is no doubt in my mind that one day relays, specifically the Gorgeous Series are the way to go! If you are looking for your first relay experience then look no further! The gorgeous series offers the whole package. These one day relays are packed with camaraderie, gorgeous views and fun finishes. I hope I get the opportunity to see you on the course! As a kid I spent my recesses running. I loved track, and sprinting down the court for basketball. As I got older I ran on occasion to clear my head, with the occasional 10k race on the books to push me to run a little more than usual. And I’d do these races often with the anticipation of socializing with friends at the end. I never tracked my pace or time. I just wanted to try my hardest and see what happens. Last September I injured my knee which required surgery in December. After that I was very worried about my recovery and knee function. I have 3 busy boys running around my house, so being sedentary isn’t an option! My boys were also worried for me. I wanted to show them how strong I was, and get back to normal as quickly as possible. I did strength and flexibility exercises regularly to get myself back in order. In April I was well enough to jog an 8k race and things just snowballed from there. I started taking running as more of a challenge. Goals for new distances and times became fun and interesting and the curiosity of how I might do if I tried really hard took over. I began to enjoy the physical and mental aspects of running more and more. I love the freedom and “me time” it provides. In 2018 I ran two half marathons, two 10k’s, a relay and several Gorgeous Pub runs. Relays are awesome because of the social aspect. The positivity and encouragement you receive from cheering each other on is the best! Hey There! My name is Miranda Bass and I have been a guru since 2016. I started running when I was in the Army National Guard and hated every second of it! I thought 2 miles was the longest distance ever.....then I got out and started doing races to give me goals and I fell in love with running and more importantly the running community. What motivates me? Well, health of course but also sweet medals and bragging rights that I do between 6-12 races a year! Running also is a great balance/head clearer for a busy, stressful day. Nothing like it really. What I think is important for every runner to remember, at all levels, is "I am running my race." Sure there are other people out there but to know you started and finished for yourself is what matters. If you are new to relays, The Gorgeous Series is great. They do monthly runs to build camaraderie and allow you to do different distances to challenge yourself. The Pub Relay is a great one to get you in the groove and all of the relays have amazing scenery and very little pressure. Hope to see you out there! I wasn’t born a runner. In fact, I never stepped foot on a track until I was in college. But it didn’t take long for me to become hooked. That moment came after I finished my first race, a 5K fundraiser organized by my college fraternity. Ever since, I’ve been running and racing nonstop. Running inspires me to be my best self. When I’m preparing for a Gorgeous race, every training run helps me become more resilient and build skills that help me overcome all obstacles. On race day, all those early morning runs pay off and the energy from the amazing Gorgeous community carries me across the finish line. ​I wouldn't be running if it wasn't for a person who inspired me. And that's why I want to be a Gorgeous Guru. Running has helped me grow. It's taught me so many lessons, introduced me to such an amazing community, and challenged me in ways I never thought could happen. But if I wasn't welcomed into the world of endurance sports to begin with, I wouldn't have been able to have those experiences. As a Gorgeous Guru, I want to show people that running is a sport for everyone. Sometimes, a person just needs someone to show them they're welcomed. Hi I am married, one son and a Siberian Husky, Honu. I love running, it helps clear my head, release stress and I get to see some really cool places. ALSO, I have met some really cool and fun people whom have become friends. ​I like Gorgeous Relays because they are through beautiful areas and it is one day, no multiple days of travel, no sleeping on the gym floor with 50 of your closest friends. I began running after the birth of my second daughter, really just to lose the baby weight. However, I noticed how much it was helping cope with anxiety, depression, and overall well being. Over time my mileage started to increase, and I found an insane love for distance running. I love the moment you find your groove, everything just clicks, and you go. The running community has been like no other community. Finding new running groups, places to run, people to run with, has been such an incredible experience. I have very big goals to get my first ultra under my belt here in the near future. I have 3 girls, an awesome husband, and a 30 mph couch potato of a dog (whippet) and this body of mine runs on plants. One of the best things about running for me is showing my girls that you can accomplish some pretty awesome things by training hard and working hard. They are the first to greet me coming home from a long run and there really isn’t anything more amazing. My advice for anyone, especially those who are just beginning their running, don’t stop. 5ks seems like a giant task when you never ran a single mile, but all the real magic happens later, when you have to really dig deep and push through some tough spots. So keep on keepin’ on, dig deep, and find your happy pace! I started running in March of 2014 on a whim, walking my dogs in the A.M. as normal. I decided to see if I could run to the end of the block. After almost dying, I made the commitment of doing a 5k within 6 months and downloaded the couch to 5k app. The funny thing is I still have not done a 5k, my crazy running friend got me to do the Gorgeous Relay in September of 2014 and that was my first running event ever! I fell in love with the camaraderie of runners. No matter if you are fast or slow you are all doing what you LOVE, and everyone is so supportive. It also was a blessing that the Goregous Series was one of my first events, as the vibe is so chill and supportive. I went on to do my first half marathon in Bend in 2015 (also a Gorgeous Series event) and have been a half marathon junky ever since. I find that I can be challenged and enjoy the time I have to myself with this distance, but not miss too much of my family time. I am the mother to two teenagers and have a wonderful supportive husband as well. We enjoy backpacking/hiking/ boating when I am not running. I love relays as you get to hang with your friends, have a ton of laughs and get your miles in. I love running because it gives me time to just escape from daily stresses and focus on myself. I love the camaraderie with relays. Hanging out with others who are experiencing what you are going through. All the support and laughter makes the hard runs much easier. I love the Gorgeous Series. The courses are all amazing, Kerry and Traci well we all know they are beyond amazing. The other teams and communities we run through are so supportive it is the best feeling. Who is a Gorgeous Guru? 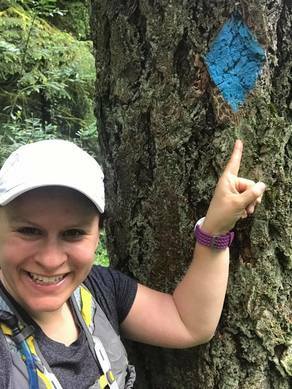 Gorgeous Gurus are runners who have participated in one or more Gorgeous events and love what they stand for-- running in beautiful parts of Oregon with a fun, relaxed vibe and supporting community. Gurus share that message with other runners through social media, representing the races at various events, sporting Gorgeous gear, and running and volunteering at Gorgeous events! Want to know more about becoming a Gorgeous Guru? Miranda Bass is the Gorgeous Guru Program Manager, and she'd love to talk to you!